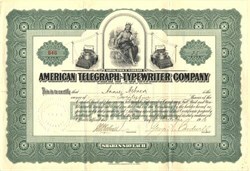 Beautiful certificate from the American Telegraph - Typewriter Company issued in 1910. 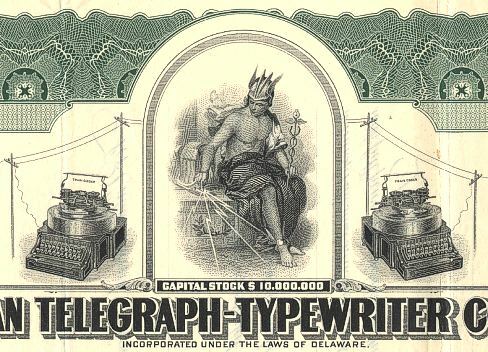 This historic document was printed by International Banknote Company and has an ornate border around it with a vignette of an allegorical man with a teletype, teletypewriters and telegraph poles and lines. This item has the signatures of the Company's President, George A. Cardwell and Treasurer and is over 103 years old. A.D. Cardwell sold interest out to Grenby Manufacturing Company, of Plainville, Connecticut, a manufacturer of machine tools and the Grenby cylindrical grinder. Grenby was owned by Carl Gray and Ralph Soby, whose fathers invented and founded the Gray Telephone Pay Station in 1885. Cardwell Manufacturing Company moved to Plainville, Connecticut.